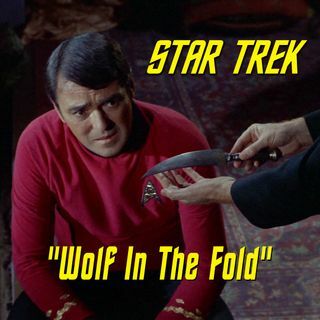 Our exploration of the spooky side of Trek continues this week, as we stalk the fog-strewn streets of Argelius II looking for the "Wolf in the Fold"! Author Marc Giller returns to the show to talk about the best episode of Star Trek: The Original Series in which Jack the Ripper possesses the USS Enterprise. Scotty's got a bump on the noggin and a distrust of girls and Dr. McCoy prescribes a little belly-dancer-related R&R to get the chief engineer back on his feet. But when ... See More the bodies begin to pile up, Kirk and crew must face down a ghost from Earth's past before the lights go out . . . PERMANENTLY! "Rational" Trek takes a powder in this episode, as we're served not only a murder mystery, but a ghost story, a slasher flick, zombies, demons, and haunted house tale, all in a script from the author of "Psycho"! During the show, Marc and I discuss Trek's desire to "laugh at the boogiemen," genre mashups, "Arthur C. Clarke" magic, the endurance of the Ripper myth, the longest scene in the series, the conflict between Alexander Courage and Gene Roddenberry, and the way spirituality is explored (or often is not) in Star Trek. We also discuss the draconian punishments of pleasure planets, the Borg as space zombies, the scandal of bellybuttons, Discount Christopher Lee, Gene's nickel-nursing, the best way to use time travel in a story, how you can't show the crew meeting God but the Devil is fine, what Gene thought of the Trek spinoffs, Marc stands up for the From Hell movie, and Aaron wants to see a hot tub brawl between Captain Kirk and Jesus Christ! Follow Marc on Twitter and check out his website to see his work! Pick up Marc's cyberpunk novels, "Hammerjack" and "Prodigal"! Flash your lights on and off for us on Facebook and Twitter! Buy us a private dance on Patreon!